As if this week’s news could get any better. Dale Earnhardt Jr. confirmed today that he WILL participate in our NASCAR XFINITY Series ToyotaCare 250 on April 23. Announced yesterday, the ToyotaCare 250 will be the second of four Dash 4 Cash races this season. The new format will be made up of qualifying, two heat races, and a final main event of 140 laps. 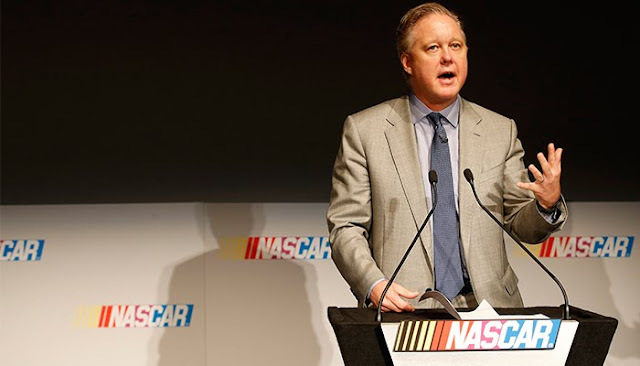 As a 2015 Challenger in The Chase for the NASCAR Sprint Cup, Dale will be ineligible to win the cash…but that doesn’t seem to soften his excitement for the new format. Tickets for the ToyotaCare 250 start at just $35 – and kids 12 & under are FREE. You really don’t have any excuse to miss this one. 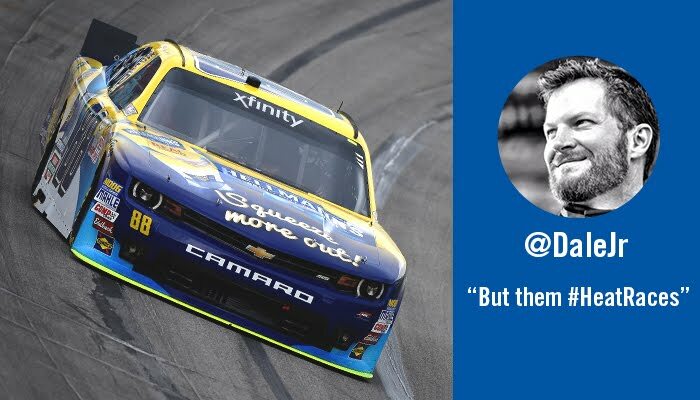 ...to the XFINITY and Camping World Truck Series, that is. Twelve and eight drivers will qualify for the XFINITY Series and Camping World Truck Series playoff system, respectively. Two three-race elimination rounds will cut the field to four before the final round at Homestead-Miami for all three Series. A Caution Clock will count down to twenty minutes after the green flag drops in the Camping World Truck Series. A caution will be called when time runs out, unless a caution has already taken place. 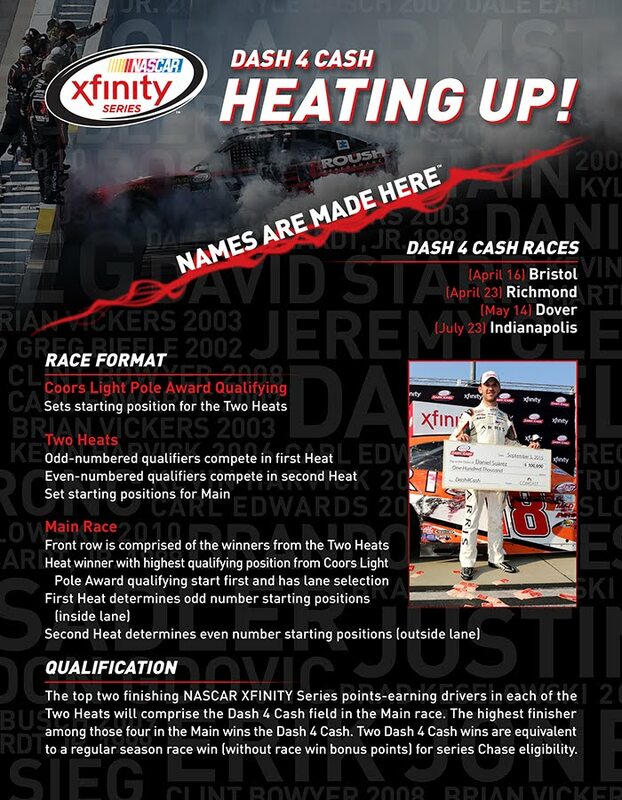 The 2016 NASCAR XFINITY Series Dash 4 Cash race schedule taps Bristol, Richmond, Dover, and Indy – in that order. The Dash 4 Cash program is moving to a new format made up of two heat races, followed by a main event. You’ve got to see racing like this. Be here April 22-24 for the ToyotaCare250 and the TOYOTA OWNERS 400. Families and NASCAR go hand in hand. Traditions with grandparents, parents, aunts, uncles, that kooky cousin of yours, and friends are in the sport's DNA. 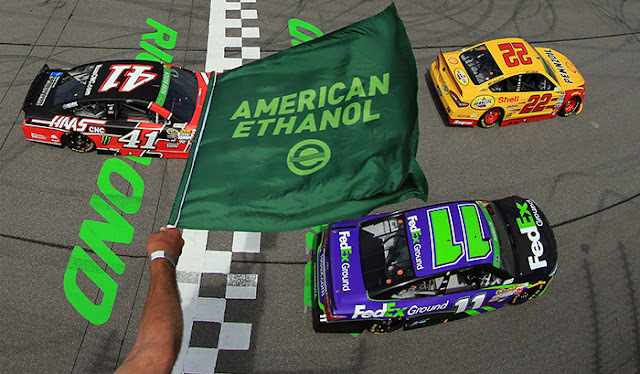 Traditions that can be passed on to future fans, so they too can feel the rush of excitement when their favorite driver take the checkered flag. 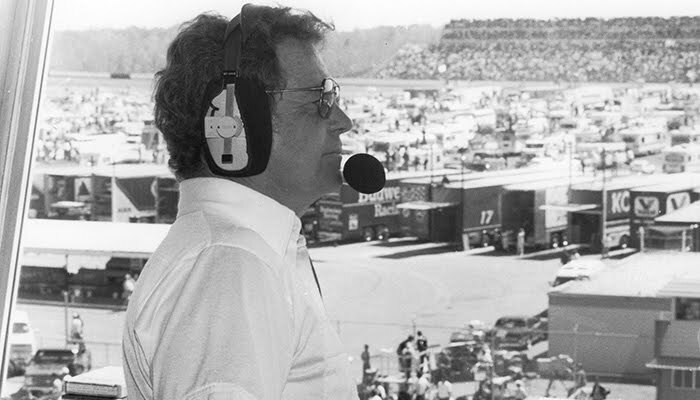 We're in the tradition business here at RIR, and as we bring back the tradition of Sunday afternoon racing we're hoping it can rekindle some of your own. Come sit in the grandstands with kids and watch them smile as they see their driver heroes in person for the first time. As they experience something new and awesome, you'll be able to relive the memories created with your parents when you came to RIR back in the day. Forty years of day racing took place at RIR, yet there's so many who've never witnessed such an event at America's Premier Short Track. That's all about to change. Now you can come see all the stars of the NASCAR Sprint Cup Series as they take to the track for the first scheduled day race at RIR since 1997. Experience thrills in every turn drivers fight their way to the front of the pack, feel the hair on the back of your neck stiffen as the cars roar past, smell the rubber burning as they come racing out of the pits. Come out and create a new tradition this April at RIR. Witness all the excitement and make lifelong memories with your family. You don’t want to miss this! You check your email one day and find…it’s time for Track Takeover is coming BACK! Why is time moving so slowly? You are counting down the days until you get back to the track. BOOM. Two words: TRACK. TAKEOVER. It’s like you can’t read about it fast enough. No other track has EVER done this before. Is it even real?! …when you see RIR in its race day glory. You beeline straight for the track. The band is rocking some classic tunes and everyone around you in just as excited as you are. Look! Over there! Is that Kyle Busch’s show car?! Exhibits for the kiddos, driver Q&As on the frontstretch…this is basically NASCAR heaven. To top it all off, you leave your mark on RIR – by signing the Start/Finish line! Finally, you head to your seats knowing you were just on the track before your favorite drivers hit the pavement. on sale to the public January 15th. 2015 Rearview: There may not have been a more dominant car week after week than the No. 4. Leading the field in Top-5 (22) and Top-10 finishes (27), tell part of the story. The three wins and 12 second place showings tell the rest. In fact, Kevin Harvick has taken last year's run to his first Cup Championship and gotten even better. No he didn't match the gaudy pole awards (eight) from 2014, but his average starting position is nearly a full spot better than it was last season. He's set a new career marks in nearly every category, and were it not for an expired engine at Pocono (a race he was leading at the time) those numbers could look even better. There's little that Harvick hasn't accomplished this season, and every time a truly great performance has been needed, "The Closer" answers the call. He needed a win at Dover to advance in the Chase, and 355 laps led later he had just that. Now he has the opportunity to do what only 10 drivers have done in their careers, and repeat as NASCAR Champion. 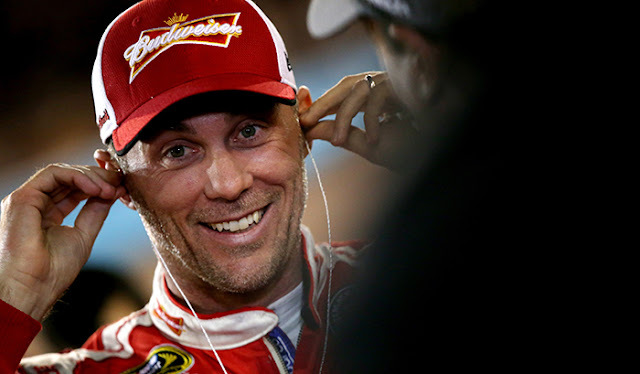 His Career: They say things get better with age, and that can certainly be said for Harvick's career. Since 2010, his age-34 season, he's seen multi-win campaigns every year but one (2012), and has finished third or better in points in those same seasons. Only Jimmie Johnson and Tony Stewart have more Chase wins to their name, and he has the chance to add a second Cup Championship trophy to his mantle. History at Homestead: Harvick's rattled off seven straight Top-10's, including the most important one of his career in last year's Sprint Cup Championship performance. In fact, the No. 4 driver has finished outside the Top-10 just twice in his 14 starts at the track. No other Chase competitor has dominated South Florida quite like the reigning champ, making him the odds-on favorite to take home the win this weekend.